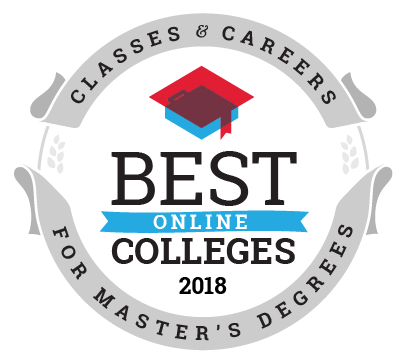 To earn a place on the Best Online Colleges for Master's Degree Programs ranking list, an online college must meet two criteria. First, they must offer their online master's degree programs at an annual tuition rate that students can reasonably pay off within 10 years of graduation. Second, they must offer a large number of master's degree programs to students (minimum of 10). 22 Western Governors University Salt Lake City, UT 26 $6,500 . $6,500 . 32 University of Phoenix-Arizona Tempe, AZ 24 $16,581 . $16,581 . 67 American College of Education Indianapolis, IN 16 $5,500 . $5,500 . 73 University of Phoenix-California Costa Mesa, CA 16 $16,067 . $16,067 . 98 University of Phoenix-Florida Orlando, FL 14 $17,234 . $17,234 . 127 University of Phoenix-Utah Salt Lake City, UT 12 $13,243 . $13,243 . 129 University of Phoenix-Colorado Lone Tree, CO 12 $15,989 . $15,989 . 131 University of Phoenix-Texas Houston, TX 12 $16,955 . $16,955 . 146 Ashford University San Diego, CA 11 $10,989 . $10,989 . 165 Western International University Tempe, AZ 10 $8,352 . $8,352 . 182 University of Phoenix-Hawaii Honolulu, HI 10 $16,319 . $16,319 . 183 Full Sail University Winter Park, FL 10 $16,401 . $16,401 . Offer their online master's programs for a reasonable annual tuition rate - $18,400 is the upper tuition limit (annual in-state tuition) for this list. The annual salary for those with master's degrees according to the BLS is $71,760. Bankrate recommends that students not accumulate more student debt than they will make the first year after graduation. According to a recent TICAS (https://ticas.org/posd/map-state-data#) study and Peterson's (https://www.petersons.com/) data, the average bachelor's student graduates with about $30,000 in student debt. Another survey by Citizens Financial Group (https://www.citizensbank.com/HomePage.aspx), suggested that current students between the ages of 18-24 said they expect to have between $39,000-$42,000 in student debt upon graduating. If you take an approximate average of those two debt amounts, $35,000, and subtract that from the average annual salary of a master's graduate, $71,760, you get about $36,800. If you maintain the Bankrate principle of not graduating with more student debt than your graduating annual salary, for graduate students who already have about $35,000 of accumulated student debt, it would be wise to find a quality online master's degree program that offers an annual master's tuition of $18,400 or less (considering master's programs are 2 years in length - 2 years at $18,400 tuition equates to the desired $36,800 master's student debt). Thus, for this ranking list, we have included online master's programs that offer an annual tuition of $18,400 or less. Offer a large number of online master's programs in a variety of study areas. We used 10 as the lowest number of master's programs an online college could offer in this ranking list. If these conditions were met, online colleges were sorted from top to bottom based on the number of online master's programs that they offer to students.